We are about to witness the clash of two tectonic plates in health care. The creation of Accountable Care Organizations, combined with a movement towards capitated and other types of bundled payments, will be forces towards integration of care across the continuum. From primary care to tertiary care to skilled nursing and rehabilitation, principles of care management will combine with financial incentives to create ever more concentration in the health care market. Proprietary electronic medical records systems and "captive" doctor organizations will work towards reducing consumer choice in this new environment. Yet, at the same time, patients and their advocates will be demanding more choice. Fully trained in consumerism in other fields, they will expect the same in health care. They will want internet-based transparency of clinical outcomes, along with tons of disease-specific information, so they can seek out and obtain the best possible care for themselves and their loved ones. They will press captive doctors to allow them to be referred to out-of-network health care companies that appear to provide better, safer, and/or more compassionate care. How will this crash of the tectonic plates be resolved? One answer is to ignore consumer preference and rely on monopoly-like organization of care. We know from other fields, however, that this not only results in monopoly pricing, but it slows down innovation. Think of the Bell System in years past, which provided integrated service, from telephone instruments to long distance calling. Many people alive today do not know that the Bell System conspired to limit people's choice to the extent that you were not allowed to connect a non-Bell telephone in your house. The company argued that doing so would cause irreparable harm to the network and knock out telephone service for miles! You could not buy your phone. You had to rent it for a monthly fee, payable forever (see below). Actually, it was even worse than that. Your bill also included a fee for every extension outlet in your house, even outlets that did not have telephones attached. And, if you wanted to make a long distance call, there was only one provider, AT&T Long Lines, the one affiliated with your local Bell operating company. You paid by the minute: There was no unlimited service based on a fixed monthly fee. Why? Because they could. Eventually, the government broke up the Bell System when upstart competitors wanted to sell telephone sets and other companies wanted to offer long distance service. Standards were established that allowed anyone to use the local network and get access to dial tone. Eventually, even that monopoly was broken when other telephone companies and cable companies were permitted to string wires into the neighborhoods. And then, even those technologies faced competition from cellular networks and voice-over-internet. Is there a lesson from all this for health care? You bet. The heart of the problem in health care has two dimensions. First, electronic medical records are often based on proprietary systems, limiting interoperability between health care networks. Second, doctors are captive members of a provider network, often one controlled by a region's major hospital or health care company. As computer guru John Halamka would note, the first problem is gradually going away, in a technical sense. With the advent of national data standards, it will be easier and easier to electronically connect patient records across multiple providers. There are already clear demonstrations of full integration in place, where two or more organizations have found it to be in their mutual interest. But we can expect geographically strong networks to resist this. It will take government action to enforce interoperability. The second problem, though, requires a Bell System-like solution. As long as physician groups are owned by or otherwise financially affiliated with hospitals, the doctors in those groups will not have the freedom to refer folks to the facilities that are optimal for patients. We can make all the claims we want about the need to have a closely tied physician network to provide integrated health care delivery, but those claims are vacuous. Such systems tend to be driven by -- and serve -- the hospitals and the specialists in them rather than the community-based physicians. Ask this question to any primary care doctor you know who is part of a hospital-based network: "Do you feel you have the freedom to send a patient to a hospital in another network? " At best, they will say, "If I really feel strongly about it, I can do so." But, if they are honest, they will say, "I don't dare do that very often, if at all. My continued participation in the contracting benefits of my network depend on sending my patients to affiliates in that network." It is time to break this system wide open and prohibit corporate affiliations between community-based providers and hospital-based health care delivery networks. Let's free up the community doctors to make referral choices based on publicly available data about clinical outcomes, quality of service, and other items that matter to their patients. If global payments become the norm, the PCPs should "own" the payment and then apportion it among secondary and tertiary providers who best serve their patients. Let the marketplace decide which hospitals rise or fall in this environment. "Next time you complain about your phone service, why don't you try using two Dixie cups with a string. We don't care. We don't have to. We're the Phone Company!" Should there be a billing code for compassionate care? Back in 2009, Dr. Amy Ship gave a moving acceptance speech when she received the annual Compassionate Caregiver Award from the Schwartz Center. The most memorable tag line from the speech was, "There is no billing code for compassion." This resonated with so many of us -- patients and providers -- in part because it set forth the proposition that compassionate care should be an inherent aspect of medical services. The idea that some portion of a doctor's or hospital's payment should be tied to such an essential human value seemed ludicrous. Or is it? A recent survey conducted by the Schwartz Center, entitled "The state of compassionate care in the United States," indirectly raises the issue. Those patients and doctors surveyed were overwhelmingly in favor of the idea that compassionate care was important to the successful treatment of patients. They agreed, too, that compassionate care makes a difference in how well a patient recovers from illness. Indeed, they believed that good communication and emotional support can make a difference in whether a patient lives or dies. But there was a gap between what patients said was most important to them, in terms of compassionate care, and what they actually experienced during recent hospitalizations. And, looking forward, both patients and doctors are worried that the changes being made in our health care system will make it more difficult for providers to offer compassionate care. Now, if we remove the word "compassionate" from the above discussion and instead insert "safety," "quality," "avoiding hospital acquired infections," or the like, our immediate response would be that we need to change the system of hospital and physician payments to provide financial incentives to change things for the better. Whether we might propose a pay-for-performance approach or some kind of global payment to encourage improvement, the current environment seems very comfortable with using the payment system to nudge behavior in the right direction. So, why not pay for compassion? Surely, we can name those aspects of care that are most closely tied to compassion, and we can likewise document whether they occur. While I will let this debate play out in the comments below, let me start it off by saying that I believe this would be a mistake. So many discrete aspects of medical care are already monetized that is hard to imagine a payment regime that would actually focus sufficient financial attention to motivate a doctor along the spectrum of less-to-more compassion. Beyond that, the idealist in me is offended by the idea of paying someone to, in essence, be more humane. In my view, this is not a matter of remuneration. It is a matter of societal values and a training program and ongoing supervision that imbues practice with those values. But, let's hear what you have to say. Should there be a billing code for compassionate care? An important warning at Walden Pond, in case you were thinking of swimming yesterday. Throw the snow in the Harbor! 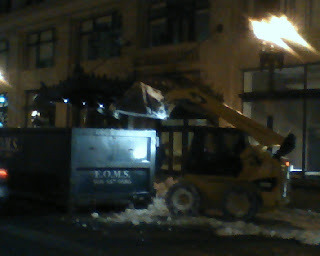 As I was walking home last night, I saw this scene on Arlington Street in downtown Boston. 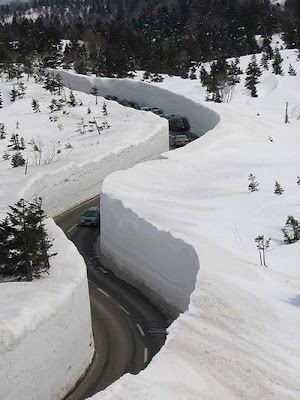 I was reminded of a story I heard the other day on WBUR's Radio Boston about the problems being faced by Boston and other communities as they engage in snow removal from municipal streets. One aspect of the problem is that state environmental officials have prohibited Boston and other coastal communities from disposing of street snow in the Harbor. Now, I don't think anyone can contest my environmental bona fide's. After all, I ran the agency that accomplished the Boston Harbor Cleanup, one of the world's largest environmental remediation projects. But this is one rule that I just don't understand. Yes, I know that snow on city streets picks up all kinds of chemicals and pollutants from the city environment, and I know it also picks up salt and chemical de-icers during its residence time. But, instead of dumping this snow in the harbor, it gets trucked -- using thousands of gallons of fuel which create all kinds of air emissions -- to inland locations. What happens there? 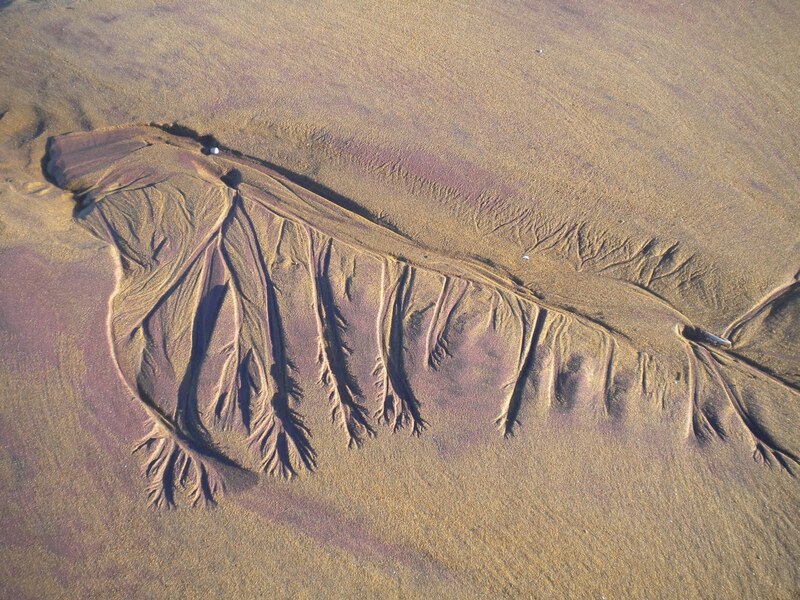 It melts, and those same pollutants enter the ground water system. Or they go into city storm drains, where they end up where? Boston Harbor. Perchance some of the melted snow goes down storm drains that empty into the city's combined system, which sends the wastewater to the Deer Island sewage treatment plant. In that case, such contaminants that are captured are concentrated in the sludge at the plant, which is eventually made into fertilizer, from which the chemicals leach out onto farmland somewhere. The contaminants that are not captured in the sludge go out through a tunnel 9.5 miles long with the plant's effluent to Massachusetts Bay, the receiving water for . . . Boston Harbor. I just don't see the point. Why don't we save the extra expense so Boston and other coastal communities can use that money for things like environmental education in the local schools? When snow falls from the sky, it goes directly into the Harbor. Let's follow Nature's lead. 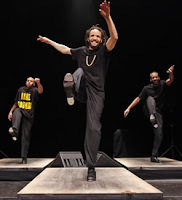 A comment by an eight-year-old girl, exiting last night's tap dance performance by Savion Glover: "That was better than American Idol!" If you know any woman currently undergoing chemotherapy, please pass the word to here that there is a cleaning service that provides free housekeeping -- once per month for four months while she is in treatment. All she has to do is sign up and have her doctor fax a note confirming the treatment. Cleaning for a Reason will have a participating maid service in her zip code area arrange for the service. The organization serves the entire USA and currently has 547 partners to help these women. Be a blessing to someone and pass this information along. I'm taking a step away from health care for a moment to offer something that might be of interest to parents. One of my former soccer players, Dr. Alexis Lauricella, sends the following note. But first this question: How can someone who in my mind is 14 be a Ph.D? Of course, as was always the case, I am really proud of her. I just wanted to let you all know that I started a website for parents about child development. I have always felt particularly frustrated by the fact that there are very few services and very little information available to help parents become the best parents they can be. This is only the beginning, but I wanted to create a website/resource where parents can learn about basic child development and parenting information. If you know anyone who is a parent, who may become a parent, or in anyway may benefit from basic child development resources (e.g., teachers, nurses, pediatricians, etc) please feel free to pass along this website and the Facebook page (See below for links) and please feel free to sign up yourselves! The website has resources and a few blog posts and I tend to post articles and interesting resources daily on the Facebook page. I would really appreciate help getting this out to people, so please feel free to pass this along to anyone. And thanks to everyone who has already "liked" PlayLearnParent on Facebook or has taken a look at the website! Global warming in the extreme? Hmm, perhaps the headline writer on Boston.com needs a chemistry lesson. At least it feels that way! Actual image of commuters in Boston this morning after the recent series of snowstorms. If you survey the American public on efforts to restrict the number of hours medical residents can work without sleep or time off, there’s overwhelming support for new rules and regulations. The relationship between lack of sleep and the increased likelihood of impaired judgment and medical errors seems like a no-brainer to most patients. The bigger challenge is to convince residents themselves – and, perhaps even more, those who teach new physicians – that work hour limits make sense...and can be implemented without compromising continuity of care or interfering with education and training. Still, a growing number of residency program leaders are discovering that the only way to move this debate forward is to dig in and start innovating and doing things differently. David Sweet and James Whiting are two such program directors who will be joining WIHI host Madge Kaplan on January 27 to describe what residency training can look like in systems grounded in patient safety, greater teamwork, better handoffs, increased supervision, and educational redesign. The changes at Summa Health System (16-hour limits are the norm for all residents) and Maine Medical Center are noteworthy; they join a growing number of residency programs not just doing the bare minimum to comply with Accreditation Council for Graduate Medical Education (ACGME) rules, but seeking to create new and better models of care. Christopher Landrigan’s research on sleep deprivation and patient safety, along with Don Goldmann’s knowledge of hospital improvement and the goals of residency training, will deepen the conversation and round out what is sure to be a rich discussion. Both Drs. Landrigan and Goldmann appreciate the challenges residency programs now face to institute critical changes, but reform also opens up all sorts of possibilities. We hope you’ll join us on the next WIHI. The piece opens with a phone call to the US Airways agent. "I see you just raised your fares to New York." Recently, Tufts Health Plan (730,000 members) and Harvard Pilgrim Health Care (1 million members) announced a plan to merge here in Massachusetts. This would leave two major insurers in the state, along with Blue Cross Blue Shield (3 million members). The bargaining clout of a larger company could help it negotiate better prices from hospitals, but one less major insurer might also mean consumers would have less choice and end up paying more, said officials of leading consumer and business groups. Has Mr. Hurst landed on an important distinction? It is one thing to assert that the merger will reduce health costs. That is certainly likely if providers have only two insurers with whom to negotiate payment rates. It is another thing altogether to argue that a merger will reduce premiums. Why? Well, in a duopoly, as noted by Mr. Buchwald, there is a tendency for the two market participants to fix prices. That is especially the case if one participant is much larger than the other. The dominant player sets the price ceiling and enjoys what economists call "monopoly rents." The secondary player needs only to use that ceiling to establish its prices, at a level just below that of the dominant firm, but also at a level that is higher than would be possible in a truly competitive market, a contestable one that would be characterized by free entry. Let's think about it this way. If you are on the Board of Tufts or HPHC, why would you merge? The first reason, and the one that I think motivates this decision, is survival. Most observers think an insurance company needs about 2 million subscribers to compete. You need this many to have sufficient economies of scale to drive down transaction costs. You also need that scale to have sufficient access to capital. And, you also need that scale to participate in the national insurance market that now characterizes the needs of large business customers. The answer here, as in other industries, must be state regulation. As a former regulator, I will tell you that state regulation is a crude alternative to competition. It is inherently ex post in nature, and it is extremely difficult to get the facts and data you need to do a thorough job. Nonetheless, with diligent, expert staff, a regulatory agency can do a pretty good job. In this situation, however, the ability of regulators to do well will be dramatically enhanced if the public is let into the process by having total transparency of the accounts of the insurance companies, the premiums they are setting, and the payments being made to the providers. In essence, the insurance companies in the state have now positioned themselves as public utilities. The secrecy of rates, charges, premiums, actuarial methodology, and the like that have characterized the system have no place in a duopoly environment. To extent current law does not permit this kind of openness, the state should act to make it a condition for the future. Implementing the program was not a simple matter. Defining a defect in a medical setting presented a challenge.... [D]octors pushed back. The argued that many instances of harm -- ventilator-acquired pneumonia, for example -- should not be considered an error because these things happened in medicine. Complications, they argued, were inevitable. This is a typical assertion, based on a belief that there is a statistically irreducible amount of harm that must occur in medical settings. There may be such a statistically irreducible amount, but most hospitals are not close to the potential minimum. As Gary Kaplan and his team showed, and as shown at BIDMC, setting an audacious target of zero defects and organizing work to reach that target can enable the people in a organization to reach or get mighty close to that target. Joseph Gavin strived for such a goal in space flight. Others are doing so in medicine. Real transparency is a concomitant of success in such a transformation. You cannot improve what you do not acknowledge to be flaws. That is why I pound away below as to its importance and as to why misuse of transparency is unethical. In her humorous way, Ethel Merman tried to show us the way when she decried the view that "these things happen." But this is deadly serious. Those who stand in the way are causing death and injury as clearly and directly as those who wield weapons. When is transparency not transparency? Answer: When it is marketing. A recent ad campaign by a well known hospital system suggests that you are better off going to one of its hospitals if you have a stroke because they have a speedy rate of administration of an anti-clotting agent. It is true that rapid administration of this drug is very important. But the data offered by this hospital system are old, based on the period 2006-2008. According to the Boston Globe, "State officials said that when data for 2009 and 2010 are released next year, they expect the gap between hospitals will have narrowed because of improved care." Look, no one will argue that you don't get excellent care at this hospital system. Quite the contrary. But to suggest that you will get better care, based on old data, just isn't right. It might even raise unnecessary concern among patients or their families. Imagine, for example, that a loved one is having a stroke and you ask the ambulance to go to a hospital that is farther away because you think that the patient will get faster treatment. The extra time spent in the ambulance might add danger itself. Also, selective use of clinical outcomes for marketing purposes is a slippery slope. Let's review the issue, for example, of "door-to-balloon" time. The Joint Commission has set a standard for opening blocked arteries with catheterization (percutaneous coronary intervention) within 90 minutes of presentation at an emergency room in a hospital. The hope is to achieve this goal at least 90% of the time. But one member of this same hospital system only accomplished this standard about 60% of the time for part of 2009. I don't recall a marketing campaign back then that referred to this result. You cannot be selective about transparency. You have to post the good and the bad. See the VA story below. If you use it for marketing purposes when the numbers are good, you rightfully open yourself up to attack for selective use of statistics. Let's just accept that transparency is about holding ourselves accountable to a high standard of care and learning from one another, rather than attempting to use it as a marketing tool. VA stands for "very accountable"
Welcome to the VA Hospital Compare web site. This site is for Veterans, family members and their caregivers to compare the performance of their VA hospitals to other VA hospitals. Using this tool, Veterans, family members, and caregivers can compare the hospital care provided to patients. Imagine that. They are actually inviting people to make comparisons of clinical quality in their hospitals. I am guessing that this kind of transparency gives people in the individual hospitals an extra incentive to do well. As I have often said about transparency, its main value is in holding ourselves accountable to the standard of care we say we believe in. This is clearly exemplified by the VA. See below for more from the website. I say bravo and congratulations! The Secretary of Veterans Affairs (VA) and the VA’s Under Secretary for Health are committed to transparency − giving Americans the facts. The Veterans Health Administration (VHA) releases the quality goals and measured performance of VA health care in order to ensure public accountability and to spur constant improvements in health care delivery. The success of this approach is reflected in our receipt of the Annual Leadership Award from the American College of Medical Quality. Much of the data in LinKS and ASPIRE are simply not measured in other health systems – VA is raising the bar. When available, VA uses outside benchmarks but often sets VA standards or goals at a higher level. VA scores hospitals more than 30% different from the goal as underperforming or red and those only 10% different from the goal are shown in green in ASPIRE. But a red site within the VA might be a good performer compared to outside counterparts. The scoring system is designed to move VA forward. ASPIRE is not about finding fault but about helping VA to target opportunities for improving performance. Many of you expressed interest in my earlier two posts about the impact of the Iceland volcano on air traffic in Europe. There is a follow-up article on aerospace-technology.com about this period of time and lessons learned. In response to claims that operators should have allowed airlines to fly, Haines states: "It would have been unthinkable to abandon the current international guidance without the necessary evidence - when you are dealing with peoples' lives it is not enough to just make up a less restrictive standard. You have to agree on a new standard based on robust evidence and data." New standards and new procedures have been researched and developed since April 2010 - including ash measurement, ash location, charting and operational planning. I'll leave you to read the rest of the article on your own, but I will observe that the airline industry and its regulators seem much more adept than the health care industry in systematically studying adverse and unexpected events, rigorously drawing lessons from them, sharing safety lessons even among competitors, and applying industry-wide solutions quickly. 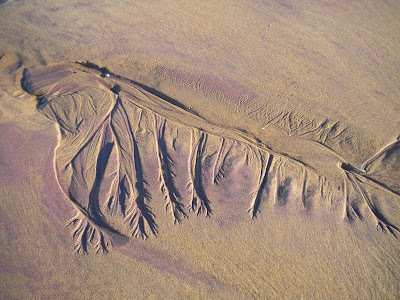 An aerial view of a river system? Not quite. It is just a pattern on a winter beach at Plum Island, north of Boston. 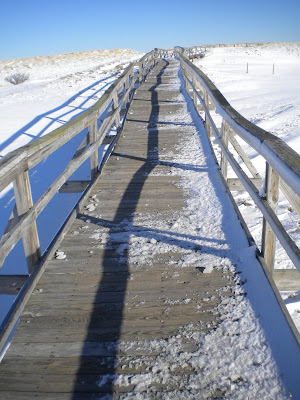 Even the walkway to the beach has a special presence on a crisp and cold winter day earlier this week. I sit on the Board of Sepsis Alliance. Our data suggests that only 1 in 3 Americans has heard the word “sepsis” and because of a lack of an organized approach to sepsis care – that is, care consistent with the Global Sepsis Alliance proclamation at the Merinoff Symposium (“recognize sepsis as a medical emergency requiring the administration of fluids and antibiotics within one hour of suspicion”) -- as many as 50% of septic patients die needlessly. That is approximately 100,000 deaths/year in the US alone. If you have a chance, check out our website and the video we created. We would love any thoughts/ideas you have. This is a disease whose natural history could be changed within the next five years – with therapies we already have. One aspect of religious dogma that has entered the medical world is that fee-for-service pricing of medical services is bad and should be replaced by a capitated, or global, arrangement that establishes an annual budget for care for different risk groups of patients. Like other religious beliefs, this is often offered without rigorous analytic support. Some insurance companies are particularly pleased with this approach because it shifts risk from insurers to providers and makes it easier for the insurers to create budgets and price their products. Don't get me wrong. This may be the right way to go, but the topic is worth more time and discussion than it has received. It may be illustrative to think about other sectors of our economy and see which of them are characterized by global payments. Not many. Sure, there are products like cellular phone service that are sold in monthly fixed dollar amounts. But that is because it is a high fixed-cost product, where the marginal cost of additional phone calls is essentially zero. Fixed prices offer revenue stability to the vendor and a way to recover those fixed costs. But most other goods and services in our economy are sold on a piece-work basis. Think of groceries, automobiles, electricity, gasoline, televisions, and clothing. Why is fee-for-service pricing appropriate for these? Or, in economists' terms, why does such pricing lead to a reasonably efficient solution? The answers are pretty straightforward. Other markets are characterized by open entry and exit and by transparent information concerning quality, value, and pricing. Consumers can make more or less knowledgeable choices based on that publicly available information. New firms enter the market when they see an opportunity. Successful firms grow. Other firms fail. In contrast, medicine is characterized by friction. Doctors are trained as radiologists, pathologists, or other specialists. The only thing they can do for a living (more or less) is sell their services as specialists. As the people at the Dartmouth Atlas have noted, this leads to supply-driven treatment patterns. If there are more radiologists in a given community, the usage of imaging will be greater than in less well staffed communities. Likewise, hospitals generally do not come and go. They, too, represent huge investment in fixed costs, and they stay in the marketplace for decades. But in addition to this, the main attribute of the practice of medicine is opacity. You and I as consumers (patients) have no idea what a given service costs because it is covered by insurance, and the actual rates paid to doctors and hospitals by each insurer are confidential. You and I also have no metrics by which to judge the quality of the service being provided. You have every incentive to request or demand more service for your medical problem. If you are an insurance company holding a hammer, every problem looks like a nail. What is the most direct thing you try to do to influence levels of care that might be excessive? Design a pricing system that shifts risks to providers and is subject to an annual budget. But, that is not the only solution. In the post below, I discuss the path being taken by Harvard Pilgrim Health Care. It is good for Massachusetts that two of the largest insurers are trying different approaches. It establishes the possibility of comparing results across the two populations. Now, though, let me let you in on a little secret with regard to capitated care. Underneath the global budget, there is still a fee-for-service arrangement establishing the transfer prices among the providers in a network. That GI specialist will still get paid for each colonoscopy. The big thing to work out in this system is the allocation of any surplus or deficit in the annual budget among the various specialists. Unless that allocation is skewed heavily towards primary care doctors, decisions about the level of care given will not change. But, if the allocation is skewed too heavily towards the PCPs, there is no real income signal for the specialists, leading to a danger that they will not feel invested in the end result. Unless the system is accompanied by intensive, real-time reporting, along with clear penalties for excessive care, it will not work. Did I say penalties? You bet. Without those, there is no enforcement of the global budget. But with those, global budgets are likely to raises hackles and resentment among specialists. I predict that the biggest issue facing physician groups in the coming years is the perceived interference by the global payment risk unit in the clinical decisions made by specialists. If we were designing the health care system from scratch, I am guessing that the HPHC approach would be more likely chosen than a global payment approach. It would be accompanied by a shared savings mechanism, where physician groups and hospitals that beat an annual budget target would get a cash reward. It would also have a hefty dose of transparency with regard to clinical outcomes, so that the pricing levels charged by each provider would be accompanied by meaningful medical information that could help consumers make more rational choices. In short, a lot of the opacity of the health care delivery system would be eliminated. That does not solve the problem of friction with regard to market entry and exit by doctors and hospitals. But global payments are weak on that front, too. Such friction may be an inherent characteristic of this sector for some time to come -- unless, as appears likely, overall payment rates for Medicare, Medicaid, and private insurers fail to keep up with the cost of living. In that case, the future will belong to the efficient, hospitals and doctors who implement Lean or other front-line driven process improvement. An article by Nina MacLaughlin in the Boston Phoenix entitled "Unlocking Knowledge" reminded me of the extraordinary step taken by MIT a decade ago -- a decision to offer course materials online, free to the world. Back in 2000 . . . the MIT faculty had to answer two questions: how is the Internet going to change education? And what are we going to do about it? Distance learning was about to take off, and there was money to be made. Some MIT professors were already in the habit of posting their course materials online so that students could access them informally. But when monetizing this practice became a possibility, people got concerned that the business model ran counter to the school's mission — a commitment to generate, disseminate, and preserve knowledge. So they took a step back. "We said, 'Let's stop thinking about money," says Stephen Carson, the director of external affairs of MIT OpenCourseWare, "and start thinking about what we can do to create benefit.' " They asked themselves: what's the Internet good at? (Spreading information widely.) What's MIT good at? (The classroom experience.) The faculty drew up a 10-page report making a case for why the conventional distance-learning model wasn't the right route to take. On top of that report — a one-page memo with a bold statement: let's give everything away for free. The site now welcomes an average one million visitors per month with the tagline: "Unlocking knowledge, empowering minds. Free lecture notes, exams, and videos from MIT. No registration required." It's a system that means Kunle Adejumo, an engineering student at Ahmadu Bello University in Zaria, Nigeria, can supplement and complement the materials and experience he's getting at his own school, which has limited resources and computer access. It also means that any interested human can click on the course offerings — pick, say, "Problems of Philosophy" — and select whatever lecture topic might be of most interest. Let's now view a contrasting approach. The Joint Commission, the main accrediting body for hospitals, recently created a Leading Practice Library. This is an outstanding idea. As the commission conducts its accreditation surveys, it encounters many excellent practices in the hospitals it reviews. The idea of the library is to share these stories more broadly. The Leading Practice Library is a complimentary tool available to organizations that are currently accredited or certified by The Joint Commission. The documents in the Library are real life solutions that have been successfully implemented by health care organizations and reviewed by Joint Commission standards experts. The Library was built from solutions that organizations have contributed that support patient safety and quality health care. By accessing the Library link, which is located on each accredited organization’s extranet page, users can browse through specific topics of interest related to their own organization and browse as many documents and topics as needed at any time. Did you catch it? You have to be a subscribing organization to get access to these helpful stories. Why not, like MIT, open them up to the world? If the library would be of value to accredited hospitals, wouldn't it also be valuable to individual patients and consumers who are involved in their own care or who are working as advocates to improve the health care system in general? Would it not also be useful to private practice physicians who refer patients to hospitals, so they could ask possible referral sites if they have considered these best practices? And, of course, wouldn't it be of value to the thousands of doctors, nurses, lab techs, rad techs, trainees, and others in subscriber hospitals who do not ordinarily know (or even know to ask) the password needed to get into the JC's website. Also, these case studies could provide fodder for fascinating academic work on process improvement. You could imagine the Joint Commission creating alliances with medical schools and the like to have professors and student study them and write journal articles or white papers that elicit even more interesting things from the cases. Having met a number of the JC surveyors, I know that this work is an outgrowth of what they have been doing informally for a number of years--sharing the best practices they themselves observed or heard about from their peers. I would guess that the surveyors would be pleased to know that the results of their work are being more broadly distributed. If that were not enough reason, let us recall that the JC does its work on behalf of the federal government, serving as the accreditation body for Medicare. As such, it is not just a private organization. It is more quasi-public in nature. How could we justify limiting the accessibility of government-sponsored work products in an era of transparency? Finally, on the business front, when it comes to quality and safety, broader distribution of ideas and programs would also add value to accredited bodies for the fee they pay the Joint Commission. Look at Institute for Healthcare Improvement, with its absolutely free Open School, which gets tens of thousands of viewers. It has not hurt and has probably helped IHI's programs that are revenue producing. So dear Joint Commission, take a leaf out of MIT's book. Give it away for free. Make it easy for anyone to read. What MIT OCW offers is the content. The school is now pairing with the social learning network OpenStudy, which offers the interactivity to create opportunities to engage with other learners. So when you're scratching your head over a single-variable calculus problem, you can connect with others taking the same course and puzzle through it together. What a shame that Ms. Strassner did not know about a simple treatment for that syndrome, published by Monique Doyle Spencer, author of The Courage Muscle. What a bigger shame that she and others have not been told by Roche Pharmaceuticals about this approach, presumably because of some corporate fear of running afoul of FDA regulations. Lots of people are thinking about the form of payments between insurance companies and providers for health care services, but it is also important to think about how each such approach would be marketed as an insurance product to the population. The payment model that gets the most attention is capitated, or global payments, combined with accountable care organizations. In this environment, an average annual budget is established for each person served by an integrated health care delivery system (ACO), and that budget is shared among the providers according to some mutually agreed upon arrangement. But the insurance product that would accompany this kind of payment scheme is often left without much of a description. As I have talked with insurance executives, they often fail to explain how they would offer consumers a desirable choice for a product based on this payment plan. Instead the main focus seems to be on shifting risk from the insurer to the providers, reducing the amount of unnecessary expenses, and sharing the benefits of those changes between the insurance company and the providers. Over time, the theory goes, the cost curve is slowed and premiums go up less quickly. But, it remains unclear what the role is for consumer in this scheme. Eric Schultz, the CEO of Harvard Pilgrim Health Care, is offering a different view. I heard him give a talk the other day and have read some of his company's materials. I will try to offer a fair representation here. Eric recognizes that changes in the payment and insurance system will have to evolve over an extended period. Noting that the current system has been in place for decades, he views that time frame as being well over five years, and more like ten. He seems to be advocating a step-wise plan, one that allows time for consumer and provider education and one that envisions mid-course corrections when the inevitable unintended consequences emerge. He is keen to avoid the kind of consumer and physician misunderstanding and resentment that characterized previous adventures in capitation. His approach is exemplified in two new product lines being offered by HPHC. The first is called Focus NetworkSM and is described here. It is being tried out first in Central Massachusetts (see map). In essence, this is a plan that offers consumers less choice, relying on service from lower cost providers, and it enables HPHC to offer a premium that is 10 to 14% below the standard product. How is it sold? While the Focus Network offers less choice, the consumer gets a clear choice between it and the standard plan. In a side-by-side comparison, a subscriber can see the difference clearly. Very importantly, HPHC advises its corporate customers to offer employees a defined dollar contribution towards their health care benefit. Doing it this way, rather than offering a defined percentage, ensures that the price differential between the two plans is not watered down in the eyes of the subscribers. The second product line is a tiered network, where providers are grouped according to their cost. Well, not cost -- price -- i.e., the negotiated rates between HPHC and the providers. Physician groups (not individual doctors) are to be put in a tier based on the total medical expense of their patients (including hospitalization costs.) Hospitals will be specifically tiered based on their own expenses. Then, consumers get to choose their site of service, knowing that their personal co-pays and deductibles rise or fall depending on the tier chosen. Under both schemes, the fee-for-service payment regime remains in effect, with a healthy dose of pay-for-performance incentives. In other words, global payments are not viewed as being necessary to change practice patterns or to influence consumer choice. As I see it, Schultz is willing to bet that his approach will bend the cost curve with potentially less public outcry and backlash than might occur with others. I also am guessing that he wants to maintain HPHC's reputation among consumers as an excellent HMO, something that is important as employers choose between HPHC and other insurers. He is doing so in a way that engages and educates consumers -- and offers elements of choice -- rather than imposing a new system that will appear to some as taking it away. With a focus on accelerating innovation in biomedical imaging, promoting translational research, and encouraging entrepreneurship, the Madrid-MIT M+Visión Consortium is currently recruiting bright young talent from all over the world – engineers, physicians, scientists, and entrepreneurs interested in biomedical imaging who are in search of a career-enhancing experience and want to make their mark on the world. Over the course of a one- or two-year fellowship in Madrid, Spain, and Boston, Massachusetts – supported by a generous stipend and travel expenses – you will be part of a team that will accelerate cutting-edge research in imaging, translate that research from bench to bedside, and establish new enterprises to enhance and enrich Madrid's biomedical research community. 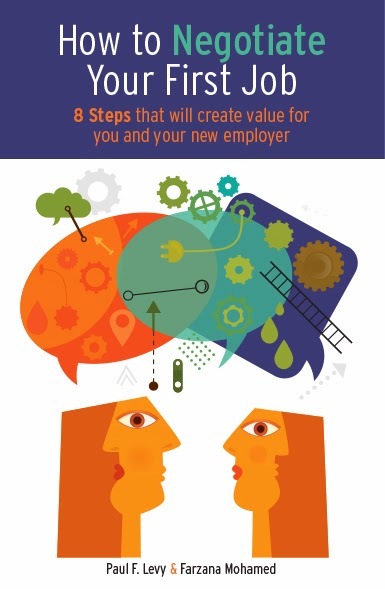 Your knowledge, skills, network, and career track will all be enhanced from this remarkable experience. Ten fellowships will be awarded. The deadline is January 25. To apply visit this site. As we celebrate the memory of Martin Luther King, Jr., in the US this week, it is moving to revisit his August 28, 1963, "I have a dream" speech. This is oratory at its absolute best. There are gems in virtually every sentence -- a use of metaphor that is unparalleled. And a construction of the entire speech that is incredibly powerful, with a rhythmic repetition of key themes that builds in intensity and beauty. View it as a great speech, but also view it as a lesson that needs to be reinforced regularly. Please take the 12 minutes and watch the whole thing. Seen in the Prouty Garden at Children's Hospital Boston. It is not soccer season -- certainly not with a blizzard here in Boston -- but reminders abound. Yesterday, I ran into one of my former players as she was heading home from sledding with a neighbor, and I was reminded of her remark one day during practice in 2009. Me to 12-year-old girls: I want you to try to remember to think about what you are going to do with the ball before it gets to you. If you wait until it arrives, you will be under too much pressure to do the right thing. Next: Ball arrives at Margaret's feet, and she boots it away to nowhere. Me to Margaret: Margaret, you weren't thinking about the ball before it got to you. Margaret: Yes, I was thinking about it. I just hadn't reached a conclusion. Management lesson. People think at different speeds. What is in the water out there in Washington? I have written before about the leadership displayed by the Washington State Hospital Association with regard to transparency and process improvement. Now they go and win the annual John M. Eisenberg Patient Safety and Quality Award from the Joint Commission and the National Quality Forum. According to this release, "This organization is recognized for its Safe Tables Learning Collaborative program. The program provides the infrastructure for Washington hospitals to share experiences and learn from one other and from patient safety experts." The Institute for Healthcare Improvement offers another engaging webcast. Here are the details. Click here to sign up for this free program. Here’s something most clinical and quality leaders agree with: a lot of specialty care isn’t always necessary or beneficial. What’s more, there’s tremendous variation across the US in the use of specialist services -- variation that tends to be driven by the volume of what’s available, not the health needs of a community’s residents. Meanwhile, in the trenches of decision making and with state-of-the-art interventions available to diagnose and treat diseases of all sorts, doctors and patients want what’s best, and potentially lifesaving. We applaud the oncologist who’s carefully helping a patient with cancer weigh treatment options; we respect the cardiologist who’s prescribing someone who’s had a heart attack the best medications to prevent a recurrence; we want the C-section for the pregnant woman who might lose her baby otherwise. It’s in this context that Doctors Neil Baker and Lawrence Shapiro and others are hard at work creating a framework to help providers get closer to an appropriate use of specialty services – to reduce unnecessary health care costs and to deliver better care to patients. Neil Baker is the co-author of a 2010 IHI White Paper, Reducing Costs Through the Appropriate Use of Specialty Services, that lays out a six-step process for generating good data about current practice patterns, analyzing the information, and making agreed-upon changes. In this model, physicians (including those making referrals to specialists) are partners and problem solvers in their areas of expertise, not passive recipients of external rules. Just ask Lawrence Shapiro. The work that’s been underway at the Palo Alto Medical Foundation is case in point of what’s possible -- and he’ll be on hand, along with Neil Baker, on WIHI to tell you about it first-hand. Improving when, why, and how specialty care is tapped also intersects with robust work going on across the country, and globally, with shared decision making—where patients, too, better understand their options and the benefits, or not, of obtaining specialty care. WIHI host Madge Kaplan welcomes this opportunity to delve into a topic that is not rocket science in terms of solutions but deserves plenty of attention and requires the best minds, and experiences on the ground, in order to make the right kinds of changes. Please join us on January 13, the first WIHI program of 2011, and be sure to invite your colleagues to join, too. To the doctors reading this, into which camp do you fall? To the patients reading this, what would you expect of your doctor in this kind of situation? In response to the question "Are there times when it's acceptable to cover up or avoid revealing a mistake if that mistake would not cause harm to the patient?" 60.1% of respondents answered "no," and the remaining respondents were almost evenly divided between "yes" (19%) and "it depends" (20.9%). Professor Margaret R. Moon, MD, MPH, a pediatrician and faculty member at the Johns Hopkins Berman Institute of Bioethics at Johns Hopkins University, is squarely in the "no" camp. "Physicians have a duty to put the patient's well-being first -- specifically, before their own," she says. "If patients don't believe the physician will do that, the whole doctor-patient relationship falls apart. In some circumstances, a physician might believe that the disclosure of error might harm the patient more than benefit the patient. But because it's difficult to know ahead of time how much a reasonable patient would want to know, erring on the side of disclosure makes the most sense." If there is a mistake that would have no medical effect but would cause extreme, uncalled-for anxiety, then yes. Why make a mountain out of a molehill if it will cause the patient more emotional upset than not saying anything? I see no benefit in revealing mistakes of no consequence, like giving a patient Tylenol 650 mg instead of 325 mg.
Why shake the patient's trust in the doctor for something that is irrelevant? A somewhat different question about medical errors -- "Are there times when it is acceptable to cover up or avoid revealing a mistake if that mistake would potentially or likely harm the patient?" -- drew an almost unanimous response. A whopping 94.9% answered in the negative, 1.6% said "yes," and 3.5% said "it depends." Some "yes" respondents hedged their bets, with one saying, "I would contact an attorney first." Another, who had no such hesitation, said, "If the mistake has not progressed to harmfulness, then it's essentially a non-issue. Treatment correction takes place and you move on." Ditto for the respondent who endorsed nondisclosure "if the mistake appears in no way possibly significant now or in the future." What do medical errors cost your state? GE Healthcare offers this calculator, based on data from the Society of Actuaries, to show the cost of medical errors for a given population. I inserted the population of Massachusetts from the most recent US Census to see what would pop up. Here is the result. I suspect this figure of $260+ million is actually an underestimate because there is a lot of preventable harm that does not get counted as such. For example, we reduced our rate of ventilator associated pneumonia at BIDMC considerably over the last three years by rigorous application of the VAP bundle. Likewise at Cooley Dickinson Hospital in Northhampton, MA. As best as I can tell, VAP is not included in the statistics above. Chances are those cases previously would not have been counted as medical errors. They were just part of the mentality of "these things happen," a belief by many that the current level of harm caused by hospitals is a statistically irreducible number. Notice that I say "caused by hospitals," and not "occurring in hospitals." Until we take ownership of the fact that a great degree of harm that occurs in hospitals is caused by failures in the manner of delivering care, we will not make progress. I have written below about the Jubilee Project, a non-profit that that harnesses the power of Internet videos and the spirit of philanthropy. Here's their latest video. I think it is compelling. Enjoy! Fellow riders on my Moroccan bike ride a couple of weeks ago would often ask about BIDMC's clinical specialties. Without giving much thought, I would say, "The usual -- cancer, cardio-vascular disease, GI, orthopaedics, infectious disease, diabetes." But upon return, I realized I had shortchanged some of my colleagues. So it is time to set that aright, at least in part. I just visited with George Tsokos, chief of our Rheumatology Division. In the short time since his arrival here in 2007, George has built Boston's largest Lupus clinical program. Systemic lupus erythematosus is an auto-immune disease that mainly strikes young women. It can be seriously debilitating. Its course is unpredictable, and treatment currently is focused on resolving symptoms, not reversing the disease itself. George's group also has the region's largest research program. He and his colleagues study the cellular and molecular mechanisms of the disease and the mechanisms that lead to tissue injury. His aim is to identify molecular therapeutic targets and disease activity biomarkers. He has plans to join with Martin Pollak, our chief of Nephrology, to create an interdisciplinary clinic. Why? Well, about 60% of people with Lupus show symptoms related to the kidneys. George was recruited by Mark Zeidel, our Chief of Medicine, who saw a need for the Boston metropolitan area to focus on this disease. Interestingly, this was a humanitarian goal, as the reimbursement rates for physicians in this field are not very attractive. Diagnosis and treatment do not to involve procedures, so there is no significant gain for the hospital, either. When Mark approached me with this idea, I wholeheartedly supported it. This is an important aspect of academic medical centers that is worthwhile for policy-makers and insurance companies to remember. While there are aspects of our clinical services that are well paid and produce a margin, there are others that make no money or lose money. But, for a young woman with Lupus, having a place to go and be seen by one of the world's specialists is very important. Mark and George make a persuasive case that this is sound thinking, even if it is not good business. I thought that you might be interested to see the latest edition of our newsletter - Knowledge Matters. We produce this every two months. It provides a range of articles on measurement, analysis and quality. Back issues of the newsletter can be viewed at this website. The next edition will be February. As you will have hopefully seen, we aim for the newsletter to be fun but informative. We do have a very wide circulation across our region (the three counties of Surrey, Sussex and Kent), also across the UK and we have a few international subscribers (which will hopefully increase if you write about Knowledge Matters on your blog!) The newsletter is produced totally in house by my team - we're now nearly into our fifth year. We started with four pages and the December edition was up to 24 pages! If people would like to subscribe the best way to get in touch with us it to e-mail quality [dot] observatory [at] southeastcoast [dot] nhs [dot] uk. Take a look. This is a great example of a locally produced, informative and engaging newsletter. Others may want to consider a similar approach and/or may just want to subscribe to this one. At a recent talk, Dartmouth's Elliott Fisher facetiously remarked that we cannot yet be sure whether accountable care organizations (ACOs) will actually be accountable, caring, and organized. Well, if some providers have their way, they certainly won't be accountable. [S]ome prominent doctor and hospital groups are pushing for features that some experts say could undermine the overall goal - improving care while containing costs. They're seeking limits on how the quality of their care will be judged, along with bonus rules that would make it easier for them to be paid extra for their work and to be paid quickly. The Federation of American Hospitals, representing for-profit facilities, goes further, urging that ACOs be allowed to choose their patients. "Providers are better positioned than CMS to determine which of their patients would be appropriate candidates," the federation wrote. So, we are happy to be held accountable, but only if we get to choose which patients are part of our network. And, how about this from the American Medical Association? The medical association doesn't want surveys of patient experiences to be used in evaluating ACOs. Right. What do the patients know, anyway? In the dispute over financial incentives, the American Hospital Association is pushing CMS to let providers collect bonuses early on and in full rather than having some of the bonuses deferred as an added incentive to keep up the good work. Collect bonuses before you earn them? Of course. Please expect a combination of commentary on current events and issues. But also please expect an occasional lesson or two from my experience of the last nine years, all offered in the hope of being helpful to others in the field. I apologize in advance if some portions seem self-aggrandizing or self-praiseworthy. I don't mean them that way, but sometimes, to be historically accurate, I'll have to include a few good things about myself! Here we go. Act 2. Isn't there a compelling -- perhaps even overriding -- moral component to transparency? The answer, of course, is yes. Doctors and others pledge to do no harm. How can you be sure you are living by that oath if you are unwilling to acknowledge how well you are actually doing the job? As scientists, how can you test to see if you are making improvements in evidence-based care if you cannot validate the "prior" against which you are testing a new hypothesis? At the most personal, ethical level, how can you be sure you are doing the best for people who have entrusted their lives to you if you are not willing to be open on these matters? Back in 2008, the Boston Globe published a story entitled, "Errors test openness at Beth Israel Deaconess." There had been a series of errors at our hospital, and many in the city were questioning whether our policy of transparency with regard to clinical outcomes was sustainable. Some felt that it would inevitably result in a loss of confidence in the hospital, followed by a loss of business, and financial pressure to be less open about such matters. I felt that transparency was essential as a way of holding ourselves accountable to the standard of care we espoused. I also believed that public trust would increase, not decrease, for a hospital that was open about its errors and its commitment to improvement. But this had not yet had a market test, and so we were taking a chance (although we were already saving lives.) In later years, the strategy was rewarded in a business sense by the decision of Atrius Health to create a new clinical affiliation with BIDMC, transferring treatment of half of their patients from another tertiary hospital in Boston. I recall Gene Lindsey, Atrius CEO, calling me in March of 2009: "We really like what you are doing in quality and safety, process improvement, and transparency. That is consistent with our values. Would you have the capacity to receive a large share of our patients needing tertiary care?" But that was later. At the time of this story, there were many doubters. How reassuring then it was for me to receive a number of comments that were helpful in maintaining my confidence about our approach. I want to share some of those with you now. As you will see, these observers nailed the issue, and I am grateful for the fact that these people contacted me at the time. There are few reasons as truly fundamental to be proud of being part of BIDMC these days as our ethical commitment to, and courage in, being “the transparency hospital.” If it weren’t hard, it wouldn’t be so important, or so worthy of feeling proud. One day it will be the ethical standard everywhere, in the same way as Beth Israel’s 1972 precedent in articulating and living by “Your Rights as a Patient” set an ethical standard every licensed health facility in the U.S. now emulates. In our weekly meeting today of the core Ethics Support Service staff, we agreed we should prioritize in everything we do during FY09 the opportunities to building a BIDMC-wide for safety and for pride, and the challenges of maximizing those as the “transparency hospital” culture of openness, safety, trust, and pride. Reviewing regularly in our monthly Ethics Advisory Committee meetings ways in which we can foster this culture at BIDMC. Thanks, as always, for serving as out CEO (“Chief Ethics Officer”). Please let us know if you have any other suggestions for ways in which we can make BIDMC even more a source of pride for everyone here – staff, Board/volunteers, patients, and their families. Tough article but I think what he is doing is courageous and that he should keep it up. More hospitals should do the same. Read the article in Globe today and want to let you know that I think what you are doing is exactly correct. The pressures must be enormous, but I'm sure you will keep doing what you are doing because it's the right thing to do. I didn’t expect to see the article on you and BIDMC. I must say that the juxtaposition of your commitment to transparency against a series that will focus on market intimidation and control, left me even more proud of you that I normally am aware. I am confident that your courage will benefit the rich reputation of the BIDMC as well as paving a course of correction for the market. You’re a brave man, and I know that what you’re doing is right and making things safer. Stay the course buddy. No one ever said it was easy to do the "right thing" eh? You're a pioneer and I'm proud of you! Paul Levy and his colleagues at BIDMC are exactly the right track in calling out errors, and they are setting an example that should be emulated energetically at other hospitals. Delivering care requires coordinating harmoniously an extraordinary number of individual disciplines. This means anticipating myriad interactions of patient, provider, place, and circumstance, and anticipating perfectly all circumstances is impossible. However, by responding when things go wrong, those working in and responsible for care delivery processes can see their vulnerabilities, identify their causes, and rectify weaknesses, leading to ever improving efficacy, efficiency, and responsiveness. This is not a hypothetical assertion: Order of magnitude improvements in care have been recorded in Pittsburgh hospitals, at Ascension Healthcare and Virginia Mason Medical Center, and elsewhere. Those hospitals not pursuing the same degree of openness are not any less dangerous. They are simply not admitting the reality to themselves, their staff, and their patients. You continue to have my continued admiration for your openness and willingness to tackle some of the tougher issues. Have faith that your strategy will prevail! I feel compelled to let you know how much I admire your fortitude around the safety issues you are so committed to. Do everything in your power to keep BIDMC intact as you see it….your patients will reap the result! Just a word of appreciation and encouragement re the transparency issue. It's important, and eventually will benefit everyone. Congratulations on having the courage to keep after it. My husband read this article on the Globe and forwarded it to me. He is a physician who now is only doing basic science at Harvard Medical Center. We often discuss about my life working as a nurse practitioner at BIDMC. I do tell him how great my working environment is and that we try our very best to be a honest hospital and staff to our patients and to each other. Yesterday, after reading this article, he as once a resident and an ICU moonlighting attending for a year, was very proud of what you have achieved for our hospital. I wanted to say another thanks to your efforts and I am pretty sure that majority of BIDMC family support you all the way! I believe we are changing the way medicine currently operates. I am so proud to be a part of this hospital. We are the future, cutting new ground, getting out the kinks so that others can follow. And they surely will be forced to do the same. I like choosing rather than being forced by outsiders. Trail blazers never have it easy. Who would want easy? I am taking an Ethics course right now. We are talking about medical Ethics. The "CEO" of Beth Israel came up. All the recent stories came up (deaths, errors etc). Our hospital was applauded for our transparency. The professor spoke and said that Beth Israel is "leading the way" towards a new future. I referenced your name, and blog, and said that I was proud to be employed by such a forward thinking institution. I think that most of the health care industry is secretive and hard to navigate. BIDMC is friendly, the doctors are usually correct, and they treat people like humans. The main issue that you are dealing with, is HUMANS run the hospital and they are imperfect vessels capable of mistakes. These mistakes in this year are bigger ones, and because of your communication with the city and media people noticed. I mean, they notice all of the good things too...they just tend to forget because Boston loves scandal. If your instinct tells you that total transparency is the right thing to do, which I assume is what it did, then continue being transparent, and just do your job to the best of your abilities. In my opinion, I think it's pretty great that you are willing to talk openly about what happened. Maybe people just want to hear that whoever is responsible feels badly about what happened. The greatest piece of feedback I ever got was, "be cool". Oh, and just remember, you are never as bad or as good as the newspapers say. Check out this website, referred by a friend. Every Monday, this young artist posts a new song he has written on this site, accompanied by notes about the music, the lyrics, as well as original art. Look through the site and scroll back to some of the previous songs and art. I hope that you enjoy it. I like the essays and art as much as the music. It is the mission of Mount Everest to blog a new song at 12 noon (e.s.t.) every Monday, thus making songwriting and recording into a practice and transforming listening into a forum. It is the purpose of this site to take chances with new ideas and sounds, to reach out and collaborate with other musicians and artists of all kinds, to reveal the creative process in a public way, and to encourage dialogue between those who make music and those who listen. The primary goal of Mount Everest is to create constantly and rock all of the time. Of course, there are links to and presence on Facebook, Twitter, MySpace, and SoundCloud. What a thoughtful approach in highly distributed and crowded field, especially with the added emphasis on shared creativity. Ideally suited for the Internet world.